Brighton winger Jose Izquierdo's two stunning strikes in February have been nominated for the Carling goal of the month award. Izquierdo curled a shot into the far top corner in Albion's 3-1 win at home to West Ham, before he scored another superb goal in the 1-1 draw at Stoke the following week. 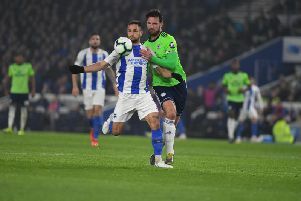 He played one-twos with Solly March and Dale Stephens, before firing low past Stoke keeper Jack Butland from 12 yards. The other nominees are Mario Lemina (West Bromwich Albion v Southampton, Feb 3); Danilo (Burnley v Manchester City, Feb 3); Victor Wanyama (Liverpool v Tottenham Hotspur, Feb 4); Mohamed Salah (Liverpool v Tottenham Hotspur, Feb 4); Sergio Aguero (Manchester City v Leicester City, Feb 10, fourth goal); and Adam Smith (AFC Bournemouth v Newcastle United, Feb 24). Voting closes at 11.59pm on Monday and the winner will be announced at 10am on Friday, March 9.